The first visit is essentially to gather the necessary information to see if chiropractic is right for you. You will meet with Dr. LeVan after filling out some brief paperwork describing your health history and your health goals. The initial consultation is complimentary and we offer this so we can get to know one another and decide whether or not at this time if chiropractic is the appropriate choice for you. To save you time on your initial visit, please go to the “New Patient Forms” page and download the New Patient Entrance form. Print it out, fill in as much detail as possible, and then call our office to arrange your first visit. If you are a good candidate and we think chiropractic can help you the next step is a thorough chiropractic evaluation and examination. 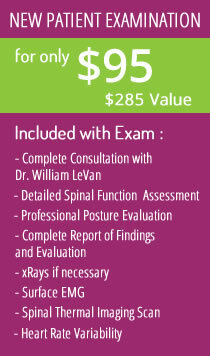 In the examination we will be checking for a condition that happens in the spine called a vertebral subluxation. A vertebral subluxation is the most common spinal injury known to science and results in a disruption to the flow of intelligence from your brain to your body and your body to your brain: it interferes with your Mind-Body connection. The chiropractic examination includes discovering any previous spinal injuries that may have caused nerve damage which in turn resulted in a lowered state of health and well-being. There are many parts to the exam and each part is explained as we perform the exam. 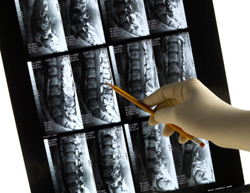 Dr. LeVan may order x-rays of your spine to confirm his findings and to help determine approximately how long the problem has actually been there. The importance of each of these tests will be explained to you at your Report of Findings. However, it is important to note that this examination helps specifically and scientifically understand the subluxation processes going on in your spine. It also gives us a baseline for future tests so we can accurately measure your progress to see how your spine is correcting and your nervous system is functioning. This examination is much more accurate than just depending on “how you feel” on any given day. 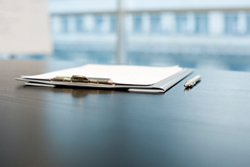 At the end of the first visit, we will give you some information on what the doctor examined you for and we will schedule your second appointment.